03/09/2012 Lesjöfors are pleased to announce their 2013 Coil and Gas Spring catalogues will be unveiled at Automechanika in Frankfurt. 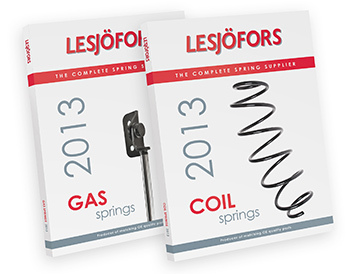 The new-look catalogues, produced in the same user-friendly format customers have come to expect from Lesjöfors, expands their market-leading Coil Spring range by 350 springs and adds over 90 new parts to their extensive Gas Spring range. Spanning 30 manufacturers, the Lesjöfors range offers the most comprehensive vehicle parc coverage on the market. Parts are listed by make, model and year to ensure you get the right spring first time, every time, and stringent product testing means quality is always assured. Visit the Lesjöfors stand at Automechanika Frankfurt (Hall 6.0 Stand A60) to access the new-look catalogues before anyone else.